Thank you for purchasing a copy of the book. I want each of you to know of corrections to the book. According to Louis Zachos, whom studied this echinoid in the Smithsonian, identifies it as a Periarchus lyelli. Thanks to Alain Vadet & Philippe Nicolleau from France for this correction. ​The perforate tubercles separates this from Gauthieria. Wrong photo (the photo is of a Palhemiaster calvini from the Buda Limestone, Travis County, Austin. The difference in a Hemiaster and a Palhemiaster is that the Palhemiaster has only a partial peripetalous fasciole. Also please note the arrangement of the paired ambs that create a perfect "X" thru the center of the test. The amb on the top left is in line with the interamb on the bottom right, and the same with amb on the top right in line with the interamb on the bottom left. 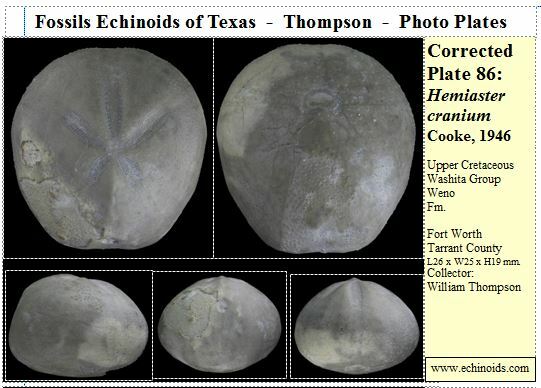 According to Louis Zachos, there are "no lunulate sand dollars before the Miocene". Also according to Dr. David Rohr, there are no marine formations of the correct age close to this locality. After speaking to Mr. Costabile, I personally visited this locality and hunted unsuccessfully for other such echinoids in the Pen Formation and later found out that I needed to hunt much higher in the formation. Maybe a later hunt will provide an answer. Until then, ther Formation will remain Unknown. Thanks to Philippe Nicolleau from France for this correction. A better specimen with the apical system in more perfect condition was found in the Edwards formation, Lampassas, Texas by Marc Vries and later sold to Philippe Nicolleau OF France.